Aquarium filtration can be intimidating for the new aquarist. It’s easy to get lost in the options and possibilities. This guide will help you understand the different types of aquarium filtration and how they will affect your aquarium and its inhabitants. 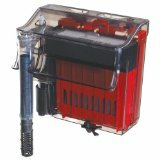 There are 3 types of aquarium filtration we are concerned with aquarists. Biological filtration happens as good bacteria living in your aquarium eat toxins from your water. This process happens naturally to some degree, because these bacteria are living on everything from your gravel to that scuba diver that blows bubbles out of his head. In order to improve the biological filtration process, we need to provide a surface that allows for lots of bacteria to grow, and force water to pass through this surface. Examples of strictly biological filters are the sponge filter and undergravel filter. Mechanical filters (covered below) also work as biological filters. 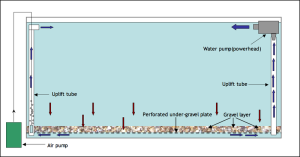 The undergravel filter (diagram above) is a plate that sits underneath your aquarium gravel. Water is pulled down through the gravel, through the plate, and then back up into the aquarium by a powerhead (water pump), or air pump. As the water passes through the gravel, bacteria living in the gravel eat/ destroy the toxins in the water. This type of filter works very well as long as the gravel is properly maintained with a gravel vacuum. 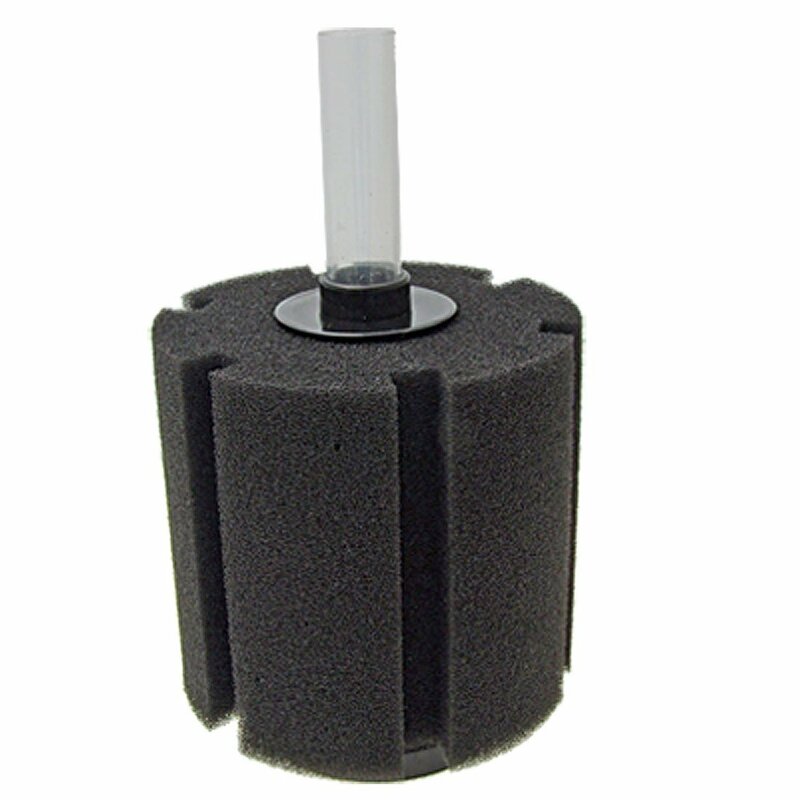 The sponge filter is a sponge that has a porous plastic tube down the center. An airline is inserted into the tube. Bubbles coming from the bottom of the sponge to the surface draw water into the sponge. As water passed through the sponge our friends, the good bacteria, destroy the toxins. Chemical filtration is the addition of a substance that helps to filter the water, control odor, or remove toxins. 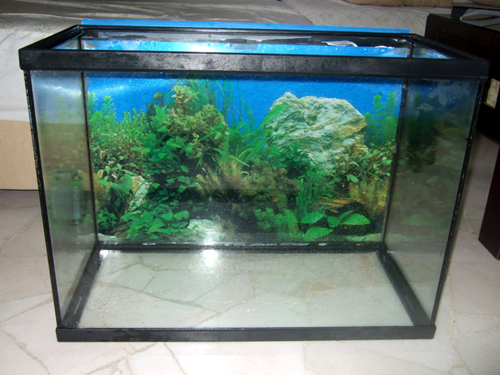 Usually chemical agents will be added to the external aquarium filter, but some can also be added directly into the aquarium if it is contained in a container or mesh bag. 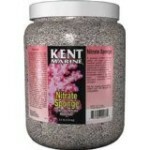 Activated Carbon is the most widely used aquarium filter media. It often comes standard in filter cartridges. 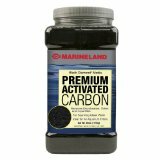 Activated Carbon absorbs pretty much everything including ammonia, odors, and discoloration caused by food or drift wood. Carbon loses its ability to absorb over time and should be replaced monthly. Why do you want to control Phosphates? 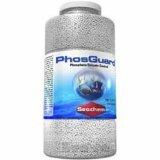 Phosphates are food for plants and ALGAE. Phosphates are introduced into your aquarium through tap water and fish food. Phosphate control media is a type of polymer resin or ceramic bead that contains Ferric Oxide. These beads are added to the power filter and absorb the phosphates from the aquarium as water passes through the filter. Nitrate is a harmful toxin produced by fish waste. Nitrate control media or “Nitrate Sponge” is considered a chemical filtration media, but is really a form of biological media. Nitrate control media is a porous form of stone that provides the ideal surface area for nitrate eating bacteria to grow. Mechanical filtration is the process of removing waste from the aquarium via an external filter such as a power or canister filter. The cartridge or sponge that is in the filter will not only trap waste, but will also act as a biological filter. As water is passed through the filter, the bacteria living on the sponge will feast on the toxins. Mechanical filters often have compartments for activated carbon, or other chemical media. A power filter generally hangs on the back of the aquarium and is sometimes referred to as a “hang on back” or “h.o.b.” filter. This type of filter is convenient and easy to access. Look for one that contains a good sized, reusable sponge for bacteria to grow on, such as a Fluval C series (featured right) or Aquaclear. When the sponge needs to be cleaned, rinse and squeeze it in a bucket of aquarium water so that the bacteria is not killed. Chlorine in tap water is not good for bacteria. 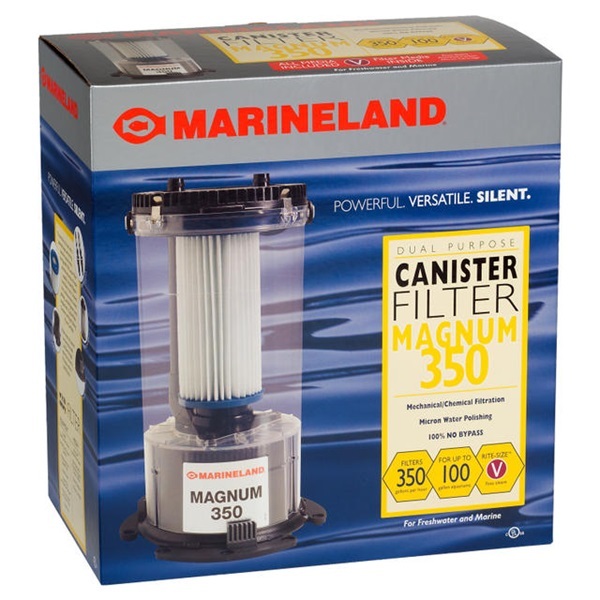 I have also had good success with the Marineland Emperor Power filters. They are equipped with “Bio-wheels” which provide lots of surface area for bacteria growth. 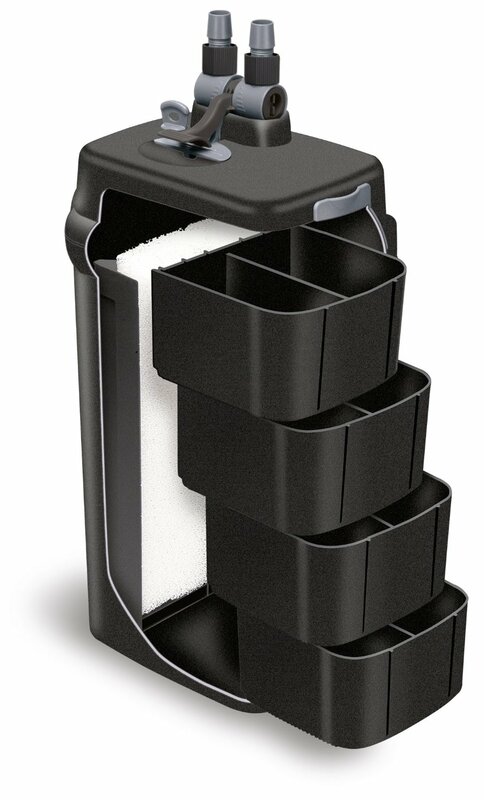 They do not come with a reusable sponge but have very large compartments where extra filter media can be added such as sponges or carbon. A canister filter goes underneath the aquarium and is connected to a “hang on” intake and outflow by tubing. Canister filters are generally much larger than Hang-on filters and can contain much more filter media. They are more commonly used on aquariums of 50 gallons or more, but a smaller one could be used on a 29 gallon. When looking for a canister filter, simpler is often better. Look for for something that can house lots of media and is versatile. The Eheim Classic canister filter (featured right) has no preset compartments and gives the aquarist complete freedom to add anything to the canister that will fit. Layers of sponges, Activated Carbon, bio balls, or any other media can easily be added. 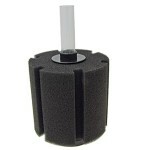 The Fluval line of canister filters (featured below) is also very versatile. 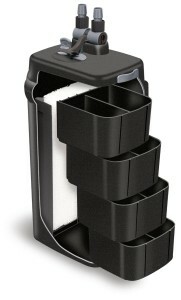 These canisters feature a stacking compartment system that allows almost any type of media to be added. It gives the versatility we are looking for and is also very convenient and easy to use. Have any input? Post it here! Feel free to ask me any questions.